Figure 1: Unilateral prolapse of third eyelid gland in an American Cocker spaniel dog. Source: Mehdi M., Sepehr M., Omid, Kazemi H. and Elnaz (2012) 'Clinical evaluation of the pocket technique for replacement of prolapsed gland of the third eyelid in dogs',Turkish Journal of Veterinary and Animal Sciences, 36(4), pp. 352-356. Figure 2: Bilateral prolapse of third eyelid gland in a mixed-breed dog. Figure 3: Unilateral prolapse of third eyelid in a Burmese cat. Source: Chahory S., Crasta M., Trio S. and Clerc B. (2004) 'Three cases of prolapse of the nictitans gland in cats', Veterinary Ophthalmology, 7(6), pp. 417-419. Figure 4: Bilateral prolapse of third eyelid in a Persian cat. Figure 3: Conjunctival imbrication or Pocket technique for repositioning of third eyelid gland. A: exteriorize third eyelid with forceps. B: Parallel incisions through bulbar conjunctiva anterior and posterior to the gland. C-D: reposition gland to proper position and suturing it in place. Figure 1: Corneal sequestrum (black/brown pigmentation indicated by arrow) surrounded by vascularisation in a cat. Source: Claudia Hartley (2010) 'Aetiology of Corneal Ulcers: Assume FHV-1 Unless Proven Otherwise', Journal of Feline Medicine and Surgery, 12(), pp. 24-35. 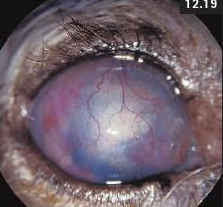 Figure 2: Central corneal sequestrum in a Burmese cat. Figure 4. 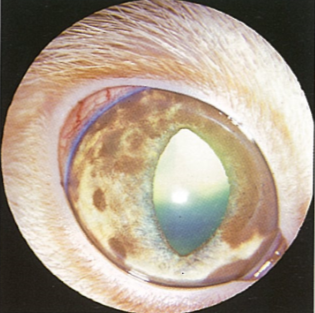 A diffuse iris melanoma in the right eye of a 14- year old neutered male domestic shot haired cat. The intraocular pressure was 45 mmHg and confirmed the diagnosis of secondary glaucoma. Figrue 5. The right eye fo a 12- year old spayed female domestic short hair cat. the eye had been treated for a chronic idiopathic uveitis for several ears and now has secondary glaucoma, buphthalmos, and a subuxated lens. Figure 6. Corneal edema associated with glaucoma in a Basset Hound. Source: Carmichael K.P., Vygantas K.R. and Whitley R.D. (2010) Ophtalmic disease in veterinary medicine, 1st edn., London: CRC Press. Figure 7. 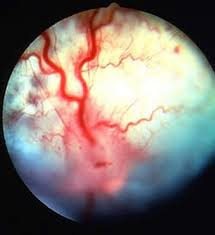 Advanced pannus or scaring in a Wirehaired Fox Terrier with absolute or longstanding glaucoma. Source: Pet Health and Nutrition Information (2013) Chorioretinitis, Available at:http://www.petmc.com/2013/04/Chorioretinitis.html (Accessed: 3rd June 2014). Andrew S.E., Tou S. and Brooks D.E. (2001) 'Corneoconjunctival transposition for the treatment of feline corneal sequestra: a retrospective study of 17 cases (1990–1998)',Veterinary Ophthalmology, 4(2), pp. 107-111. Carmichael K.P., Vygantas K.R. and Whitley R.D. 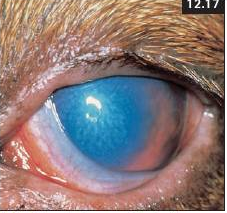 (2010) Ophtalmic disease in veterinary medicine, 1st edn., London: CRC Press. Chahory S., Crasta M., Trio S. and Clerc B. (2004) 'Three cases of prolapse of the nictitans gland in cats', Veterinary Ophthalmology, 7(6), pp. 417-419. Claudia Hartley (2010) 'Aetiology of Corneal Ulcers: Assume FHV-1 Unless Proven Otherwise', Journal of Feline Medicine and Surgery, 12(), pp. 24-35. Donisa A., Muste A., Beteg F. and Muste M. (2010) 'Retinochoroiditis in dog: diagnosed and incidence', Veterinary Medicine Scientific Papers, 43(2), pp. 100-103. Gimenez P.M.T.P. and Fariña I.M. 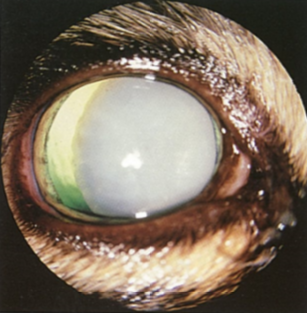 (2002) 'Lamellar keratoplasty for the treatment of feline corneal sequestrum', Veterinary Ophthalmology, 1(2-3), pp. 163-166. McLellan G.J. and Miller P.E (2011) 'Veterinary ophthalmology', Feline glaucoma – a comprehensive review, 14(1), pp. 15–29. Mehdi M., Sepehr M., Omid, Kazemi H. and Elnaz (2012) 'Clinical evaluation of the pocket technique for replacement of prolapsed gland of the third eyelid in dogs',Turkish Journal of Veterinary and Animal Sciences, 36(4), pp. 352-356. Pet Health and Nutrition Information (2013) Chorioretinitis, Available at:http://www.petmc.com/2013/04/Chorioretinitis.html (Accessed: 3rd June 2014). Raza A., Naeem A., Ahmad M., Manzoor A. and Ijaz M. (2013) 'Cherry Eye: Prolapse of Third Eyelid Gland in Dog- A Case Report ', International Journal of Molecular Veterinary Research, 3(1), pp. 1-3.